At the recent McGraw Hill Education Stanford Personalized Learning Forum, Jason Green and I had the opportunity to lead a workshop on personalizing learning through the Playlist model of Blended Learning. Since we wholeheartedly believe that the mindset shift to a blended learning culture requires experiential understanding of the models, we put participants into a Playlist model simulation. Here’s how we did it and the takeaways from participants. We opened with a discussion of the Blended Learning Hallmarks: Personalized, Agency, Authentic Audience, Creativity, and Connectivity. We then discussed the importance of balance in a blended learning model, especially one that has a fair amount of independent, asynchronous learning like the Playlist model does. From there, we put participants into a Playlist rotation via Google Form. The Form simply listed the Playlist activities learners could choose and allowed learners to select them in their preferred order of completion. In a classroom Playlist, we would encourage even more choice and personalization beyond order and pacing. This could include an ongoing personal project or the creation of a few different playlist paths based on small group learning targets. 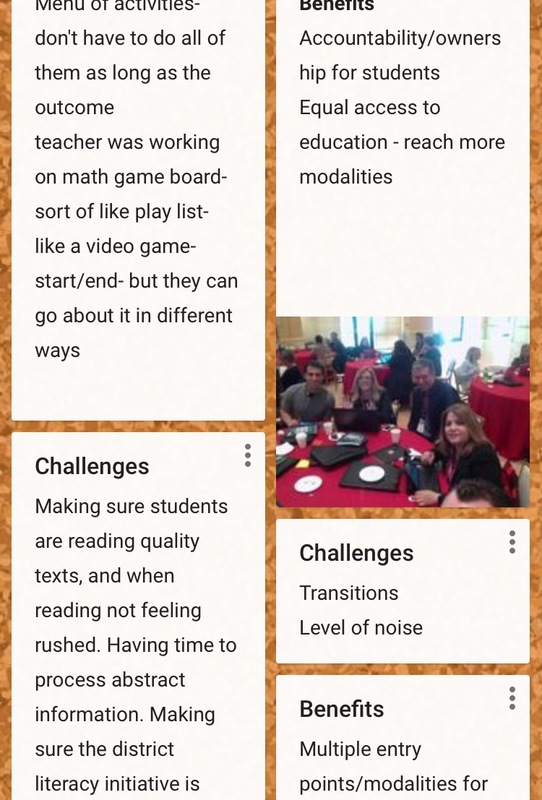 Following the asynchronous Playlist rotation , we moved the group into synchronous group work, discussing benefits and challenges of the Playlist model amongst the members of their group and then sharing these takeaways on Padlet. We closed with a whole-group reflection, examining the interesting data from the Playlist, which showed that learners tackled the tasks in multiple orders. While the benefits were easy to identify, so too were some of the challenges of the Playlist model. Here’s what came to light along with some suggested solutions. For skills tracking, the use of adaptive tools can greatly reduce the challenge of creating personalized pathways for students. The most robust tools available right now are in math and language arts. For competency alignment outside of skills, it’s essential to have a clear list of targeted outcomes and to design backwards from there. Teachers should not have to do this heavy lifting on their own. As more open resources become available, schools and districts have the responsibility of allocating resources to curriculum leadership to help curate and align these resources. Teachers can hold students accountable for demonstrating the pace and order in which they complete Playlist activities via tools such as Google Forms or learning logs. 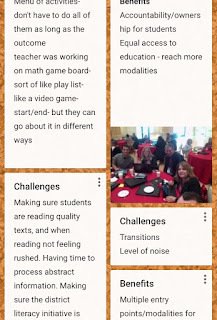 Catlin Tucker has an outstanding post on how to replace clunky binders with multimedia blogs and critical conversations with students. In a rotation model, it is essential to set the expectations for movement, device use, noise level, and productivity before putting student into a rotation. Expectations for participation in online discussions and for submitting work also must be set. In Blended Learning in Action, chapter 8 focuses on effective practices for “onboarding” students. While student choice is key to fostering agency, co-creation of the playlist can help ensure that students are making quality selections at their level. By having conversations about learning paths and identifying learning goals, students can be better empowered to make strategic choices when given choice. To gain teacher buy-in in implementing a Playlist model, teachers should understand how the model can help solve a pain point in their instructional process. Coaching should focus on identifying what is most challenging to then find the solution to that challenge through the new model. Further, teachers can feel more confident in implementing a new instructional model if given a specific model of how to do it and experiencing it themselves through personalized PD. Teacher support and professional development is another area that must be supported as districts migrate through transformation.